On Wednesday, May 14th from 1:30-5pm national law enforcement agencies (including the FBI, DHS, ICE) will be meeting with local Bay Area law enforcement agencies at Twitter’s headquarters in San Francisco. This is an annual meeting dubbed “Building Communities of Trust,” where federal and local police reach out to civil rights and community groups–mainly brown and black organizations and particularly Arab and Muslim groups–in order to “assure” them that they are committed to the safety and protection of the marginalized. It would take a hopelessly naïve and ignorant person to believe the sincerity of the government’s intentions, not least because they are reaching out to a few Arab and Muslim organizations to legitimize their efforts, but even more so given the fact that law enforcement are reaching out to Arab and Muslim groups while they have successfully constructed us as the new face of the enemy under the guise of “fighting terrorism”. 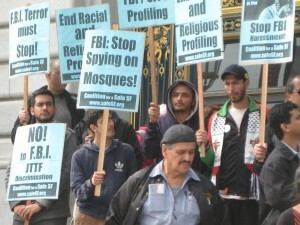 Since the deployment of this constructed “terrorist” enemy provides justification for the ongoing criminalization and policing of poor, black and brown communities, the need for “safe” gentrified neighborhoods, and the sought after partnership with tech companies, the participation of our Arab and Muslim communities in these types of meetings is nothing more than an attempt to normalize the ongoing campaigns of state violence and displacement committed by the hosts of this meeting. The meeting will be hosted by the Northern California Regional Intelligence Center (NCRIC), the local fusion center – which is where the federal government, specifically the FBI and DHS, work in tandem with local police departments to conduct surveillance, monitor our communities, and share intelligence. Fusion centers also house the“Suspicious Activity Reporting Initiative” (SAR), a federally funded “see something, say something” program, nothing short of a legalized form of racial profiling. The connection between the tech industry, gentrification, and law enforcement is deeply embedded in the effort to monitor, control and police our communities. Take for instance a modest look at the changing San Francisco Bay Area landscape over the past five years, Google Bus included, and it is enough to reveal the inextricable relationship between giant tech companies and gentrification of the Bay Area. Law enforcement plays the necessary role of enforcing the safety of San Francisco’s whiter and richer newcomers, ensuring them and their interests protection from the browner and poorer inhabitants of the gentrifying neighborhoods. But the relationship that may not be so clear is the one between law enforcement and tech. Thankfully for us Twitter has made that relationship easier to see. The meeting will be hosted by the Northern California Regional Intelligence Center (NCRIC), the local fusion center – which is where the federal government, specifically the FBI and DHS, work in tandem with local police departments to conduct surveillance, monitor our communities, and share intelligence. Fusion centers also house the “Suspicious Activity Reporting Initiative” (SAR), a federally funded “see something, say something” program, nothing short of a legalized form of racial profiling. The ACLU and ALC were able to make public 1700 Suspicious Activity Reports. What they reveal is astounding, though not in the least bit surprising. The reports demonstrate that you can be accused and investigated for suspicious activities for no other reason than being brown, or “looking Middle Eastern or Muslim,” i.e. fitting the description of a “terrorist.” Thus, the SARs program is the new front in the domestic “war on terror,” where the government and law enforcement seek to document and criminalize Arabs, Muslims and anyone else who fits this “terrorist” description. The reason we are not surprised by these kinds of revelations is because Arabs and Muslims, and all communities of color know all too well the racialized nature of “suspicion” and surveillance programs. The logic of “if you see something, say something” is exactly what led to Alejandro Nieto’s murder by SFPD this past March, for doing nothing more than eating a burrito on Bernal Hill before work. In the tragic but not exceptional case of Trayvon Martin, the logic of “see something, say something” was expanded to “see something, do something”: murderer George Zimmerman was unsatisfied with simply reporting a “suspicious-looking” person to the police, but took it upon himself to play policeman. The message is clear: SF’s gentrifying neighborhoods and Zimmerman’s gated community should rid themselves of dark-skinned “suspicious” elements, and the police (or wannabe police) are more than happy to carry this out. – in short, criminalized for existing. And attempts by communities to struggle against this violence will also be criminalized (take for example, one of the activities documented as suspicious by a California fusion center: “Reporting party received an e-mail that describes a scheduled protest by an unknown number of individuals on July 7, 2012. The information indicates the protestors are concerned about the use of excessive force by law enforcement officers”). Though disturbing, it is not at all surprising that major tech companies like Twitter would partner with both federal and local law enforcement agencies and programs. The last meeting like this took place at Facebook’s headquarters. Tech needs law enforcement to defend its interests, through both surveillance and violence, and law enforcement needs tech to provide it with the means and tools of surveillance and repression. Thus, surveillance and practices of “fighting terrorism” on a national level bear an undeniably intimate relationship with the campaign to “fight crime” in the urban cities. 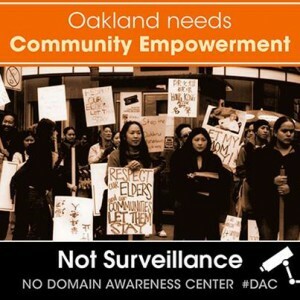 As a clear recent example, take the Domain Awareness Center (DAC) in Oakland. Funded by the Department of Homeland Security, it is basically a mass surveillance center meant to keep the Port of Oakland safe from “terrorist attacks.” The City of Oakland, seeing a glorious opportunity for population control, proposed to expand the functions of the center throughout the entire city, citing the need to “fight crime.” This would have meant that all the feeds of Oakland’s surveillance cameras, license plate readers, sound recorders, social media monitors, etc, would have been aggregated into one place. Further, emails made public showed that Oakland city officials were in conversation with Google about working together on the project. So here we have the whole party – federal and local law enforcement, big tech, the campaigns of “stopping crime” and “stopping terrorism,” all taking place in the quickly gentrifying context of Oakland, and all housed under one roof. Fortunately, the people of Oakland obtained a partial victory when the Domain Awareness Center was stopped from operating throughout the whole city, its activities being restricted to the port. This victory was a direct result of communities coming together and organizing against the implementation of the DAC, packing city hall during city council meetings and holding protests against such a widespread surveillance project. Community organizing is ever more necessary given the intensified project of state repression facilitated through gentrification, surveillance and policing of our communities. It doesn’t start or end with Fusion Centers. And it doesn’t end with the DAC. This September, Oakland will host its 8th annual Urban Shield event – a trade show and training exercise for SWAT teams and police agencies – bringing local, national and international law enforcement agencies together with defense industry contractors to provide training and introduce new weapons to police and security companies. Urban Shield represents everything our communities have been struggling against from displacement, militarization, to state violence and repression. It exposes the role of tech, local and federal law enforcement agencies, and international actors including the apartheid state of Israel, in maintaining a global state of repression. As we draw on the connection between tech, surveillance and gentrification, we must also challenge its role in militarization, state violence and repression. Through the shutting down of fusion centers and events such as Urban Shield, through collectively organizing our communities, and challenging efforts to co-opt our movements, we can we make it known that these forces are not welcome in our neighborhoods.